Six intertwining vignettes tell the story of a family’s violent murder, which curses a house along with anyone who enters it. Katasumi – Classmates Hisayo Yoshida and Kanna Murakami tend to their school’s rabbit cages in a corner outside. When Kanna pricks her finger, Hisayo goes inside to retrieve a bandage. Left alone and bleeding, something unseen attacks Kanna. Hisayo returns to find the cages destroyed, the rabbits mutilated, and Kanna missing. The ghost of Kayako Saeki crawls towards Hisayo, causing the girl to fall to the ground in fright. Hisayo sees Kanna’s corpse lying next to her. Kanna suddenly reanimates and joins Kayako in slowly approaching Hisayo. 4444444444 – Tsuyoshi Murakami hears a discarded cellphone ringing while riding his bike. Tsuyoshi finds the phone and answers a call from a number displaying a string of fours. After hearing only strange noises from the other end, the pale ghost of Toshio Saeki suddenly appears next to Tsuyoshi. Toshio – Concerned because the boy has stopped attending class, elementary schoolteacher Shunsuke Kobayashi looks into the disappearance of Toshio Saeki. In reviewing the boy’s file, Shunsuke discovers that Toshio’s mother Kayako’s maiden name was Kawamata. Shunsuke asks his pregnant wife Manami if she remembers Kayako from when they knew her in college. Shunsuke visits the Saeki home, where trash is strewn about as though a struggle took place. Shunsuke finds Toshio with wounds all over his body and acting as if in a strange state of possession. Yuki – Noriko Murakami leaves her daughter Kanna to study with Kanna’s tutor Yuki. Yuki, who intensely dislikes cats, hears odd noises that Kanna does not. Remembering that she has to feed the rabbits at school, Kanna leaves, teasing her brother Tsuyoshi on her way out the door. Still hearing strange sounds, Yuki hides in a closet to escape a black cat and finds an opening leading to the attic. There, Kayako’s ghost attacks her. Tsuyoshi leaves the house having not heard anything. Mizuho – Tsuyoshi’s girlfriend Mizuho Tamura looks for Tsuyoshi at the school. Mizuho ends up alone in the dark, tormented by footsteps, a shaking table, and a ringing cellphone, which she was returning to Tsuyoshi. Mizuho answers a call from the number 444444444444 and hears a cat meowing on the other end. Feeling a pull on her arm, Mizuho turns around and sees Toshio’s ghost making the cat noise from his gaping mouth. Kanna – Examining Hisayo’s body discovered outside the school, a doctor reports to police that a jawbone belonging to another person was found with the corpse. Noriko Murakami comes home to an unexpectedly empty house. Kanna returns as a bloody ghost and reveals to her mother that her jawbone is missing. Kyoko – Realtor Tatsuya Suzuki has his psychic sister Kyoko inspect the Saeki house, as the Murakami murders have made it unmarketable. Kyoko encounters Kayako’s ghost in the house. Her psychic insight tells her that because evil spirits can corrupt sake, prospective buyers must drink from a bottle left inside the house. If it tastes foul to them, then they are more susceptible to the vengeful curse. Kyoko rushes from the house after making her brother promise to have new homeowners drink the sake to test how dangerous the house may be to them. Kyoko later learns that Tatsuya sold the house when he calls asking her to visit his troubled son Nobuyuki. Kyoko walks past the house on the way and sees Yoshimi Kitada, the wife of the new owner, in a seeming state of possession through the window. Watch “Katasumi,” retitled “In a Corner” for its U.S. release as a DVD extra, and “4444444444,” aka “Ten Fours” (even though the phone number featured technically displays twelve fours), with foreknowledge of the franchise they would spawn and surprise might be the first reaction. Both shorts are shot on video with an unsteady camera, lending the look of cheap rush jobs by person(s) charitably described as “aspiring” when “amateur” might be more appropriate. Climactic scares then arrive without context, quite literally limited to a chalk-skinned woman in the first and a chalk-skinned boy in the second appearing with an open mouth before quickly cutting to black. Had these premiered as part of a horror shorts block during a film festival, it is unlikely either would imprint enough of a memory to warrant a write-up in post-fest coverage. Creative types, take note. If you’re familiar with the concept of “idea debt,” you know what goes into creating story bibles, concept sketches, outlines, and exhaustive notes while painstakingly plotting the next “Star Wars” saga, “Harry Potter” series, or million dollar entertainment idea. Maybe you’re inventing too much work for yourself. With two one-note shorts comprising six minutes of material, Takashi Shimizu unknowingly founded a profitable property consisting of movies numbering in the double digits, over a half-dozen novels, comic books, a video game, even a pachinko machine. The inspirational lesson here is figure out details later, focus on producing content first. Although the success of Shimizu’s accomplishment is unassailable, effectiveness of execution on the series’ earliest entries is open to debate. Like the pair of three-minute pieces preceding it, first feature in the franchise “Ju-On: The Curse” operates with minimalism as its mantra. For good and for bad, that simplicity applies to style as well as scares. A “juon” is a curse created from such strong vengeance that the place where the death took place gathers the victim’s grudge as an evil force. Anyone coming into contact with that curse subsequently dies, birthing another curse in the process. “Ju-On: The Curse” is an anthology of sorts centered on a different character for each 10-ish minute segment. Chapters, as well as events depicted, are arranged out of chronological order, ultimately interconnecting into the tale of the Saeki family’s juon and its ripple effect on the Murakamis, a family unfortunate enough to move into the Saekis’ cursed home. Viewer and reviewer comments made closer in time to the movie’s release mention confusion stemming from this disjointed structure. Coming at “Ju-On: The Curse” for the first time many years after the fact, when genre entertainment has ensured some knowledge of ghost boy Toshio and his contortionist corpse mother Kayako, impartiality evaluating a confusion factor is challenging. I didn’t have difficulty following along, actually feeling that gradually filling in the background enhances the storytelling, though I also knew some of the outcome. For those going in blind, mentally refitting each piece into a coherent timeline once the credits roll might not come easily. The movie’s greater issue is that all six segments end exactly the same way. If this were written in annoying contemporary vernacular, the previous sentence would have concluded in all caps, or with a period following each of the last four words. Toshio sits behind a protagonist and meows from his gaping mouth. Kayako confronts a protagonist and croaks from her gaping mouth. Toshio confronts another protagonist and meows from his gaping mouth. The fourth segment ups the gaping mouth ante by having a character confront a ghost whose entire jaw is missing. Then back to Kayako croaking while confronting one more person. The final chapter concludes with yet another ghost vs. human confrontation, but cuts to credits before the mouth can go Grand Canyon. I would have written SPOILERS above that paragraph except I don’t see how those revelations spoil anything, much less how reusing an identical beat could still be a surprise by its sixth usage. I understand that numerous people have expressed finding “Ju-On: The Curse” to be nightmarishly frightening, haunting imaginations endlessly even after the movie is over. What I don’t understand is how this holds true after seeing six consecutive setups lead to six duplicate climaxes. Characters aren’t serving story at this point. They are serving a simple scare, and the lack of context behind the repeated reveal dulls any impact beyond a visual impression. 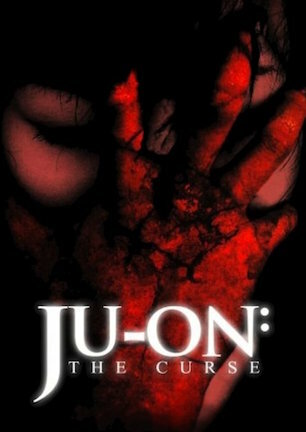 Its origins as a direct-to-TV production don’t lend “Ju-On: The Curse” a very cinematic look. The 4:3 frame feels claustrophobic. The shot-on-video grain looks cheap. The camera is restricted to often uninteresting shots, occasionally canting itself or shooting through a window to add some sort of personality to the presentation. “Ju-On: The Curse” is an atmospheric mystery, to be sure. But disassociating it from the juggernaut it would become and taking it at face value, the movie has a hard time holding up to fresh eyes over 15 years later. “Ju-On: The Curse” can always be appreciated for its globe-spanning grip on pop culture and its importance in horror film history. Barring a time travel trip to before the J-horror enthusiasm balloon burst, when it could be experienced in the original moment, appreciating the movie as a trip into terror is now dependent on tolerance for low-quality technical aesthetics, and a proclivity for finding fright in an underwear-clad Japanese boy meowing menacingly. February 3, 2016 by Ian Sedensky.